Entered from the underground car park or street level, take the elevator up to the 4th floor. The hallway has a heated slate floor, bench and hooks. Both bedrooms are to the left, the master bedroom has a wood framed king bed, bedside tables, lamps, chest of draws, built in wardrobe, TV & DVD player and en-suite bathroom with a large steam shower. 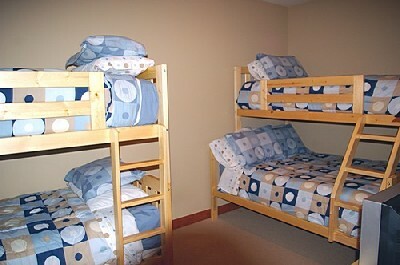 The den has two sets of bunk beds, the first being a queen with a single on top, and a single bunk. This bedroom has a ceiling fan, chest of draws and TV. 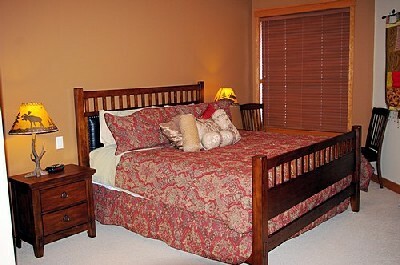 Both bedrooms are fully carpeted. To the right of hallway is the shared bathroom with deep bath tub and overhead shower. Separate washer/dryer is located in the front passage cupboard. 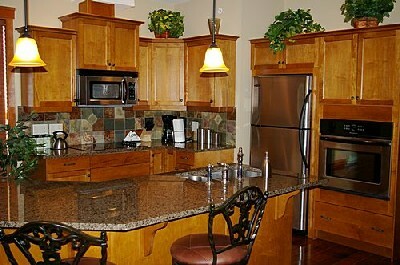 The apartment opens up into a large open floor plan with a kitchen, living room and a large dining table. The kitchen has granite work surfaces, wood cabinet doors, large stainless steel fridge with ice making facility in its freezer, separate ceramic hob, eye level convention oven, and a dishwasher. The breakfast bar has comfortable high backed stools. There is a stone clad gas fireplace and flat screen TV, DVD player with surround sound, two leather sofas and a coffee table. 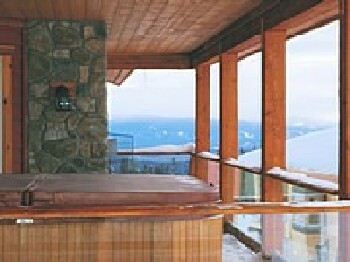 A sliding door leads to the balcony with private hot tub and BBQ. 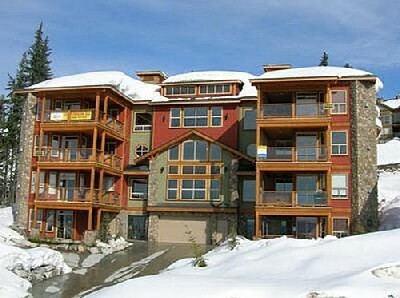 There is a ski door located half a level from this unit. From here you walk across the road to the ski run that takes you down to Plaza, Ridge Rocket and Snow Ghost chairs. The ski back is off the village way, it runs parallel to the road. Happy Valley is an easy 5 minute walk where the ice rink, snow coaster rides, beginner learning areas and the Happy Valley Lodge reside. 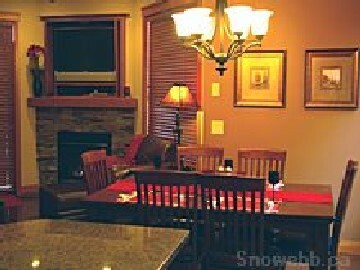 The Happy Valley Lodge has many family organized activities, such as pop idol night and movie night. Bedroom 2 also has a double over a single bunk.